MyHub Intranet Solutions serves a wide range of international customers ranging from small business through to large enterprise across all markets. Build an intranet quickly and easily with MyHubs cloud-based intranet portal software. Whether you are looking for an intranet for small business or a corporate, we cater for all company sizes. MyHub is a low-cost intranet solution that provides an out of the box intranet with a range of powerful business tools designed to improve internal communications and employee engagement. 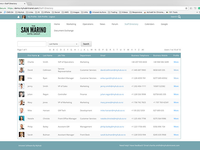 Such as staff directory, profiles, secure login, mobile friendly, document/file storage, blogs, forums, custom pages. Cons: A few more options for modules would be great (although I cannot give you an example off the top of my head) and the constant reloading of the page after button clicks and exiting an edit can be a little frustrating but not enough to discourage use. Also would like to be able to change the background colour. Overall: Almost half our workforce is on the road so we needed a place for them to easily access information when they're on the go, as well as a one-stop-shop for information and resources for the wider company - MyHub is an affordable and easy-to-use solution for this. Their customer service is exceptional - quick responses, updates on developments, quick fixes and even follow-up explanations to what caused the problem in the first place. If you develop an HRIS, let me know - we would be very interested! MyHub functionality is excellent and Customer Support is beyond outstanding. I fully recommend it!! Pros: MyHub software is relatively easy to use and is extremely flexible. 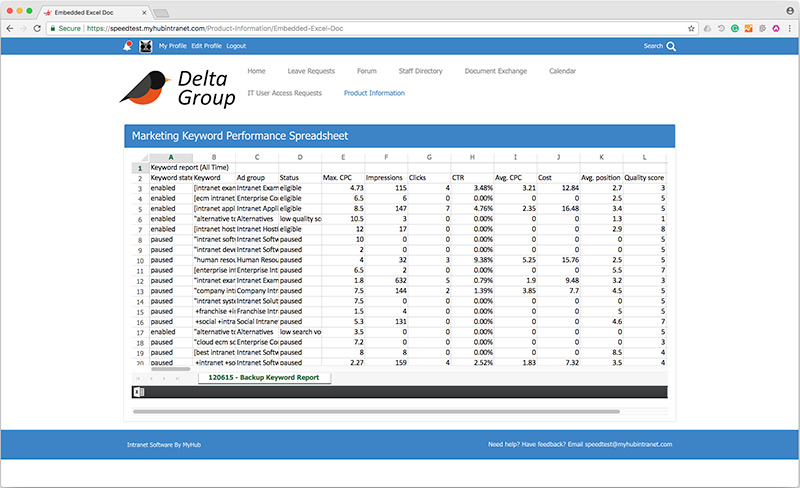 It took less than a few weeks to develop a multi-page private portal, with a large amount of data, that meets our needs. The pre-built templates and the one-on-one virtual training, along with the support guides and videos, jump-started and enabled quick development without needing a technical background. Page creation, page management, security, and user management are excellent. The customer service is the best in the industry in responsiveness, addressing issues, and providing helpful solutions. MyHub aims to please and consistently goes above and beyond as a premier vendor! The cost of MyHub is unheard of in the industry. Cons: The Document Exchange capabilities were the main reason for us to select MuHub. The Microsoft Explorer structure and associated security are excellent. 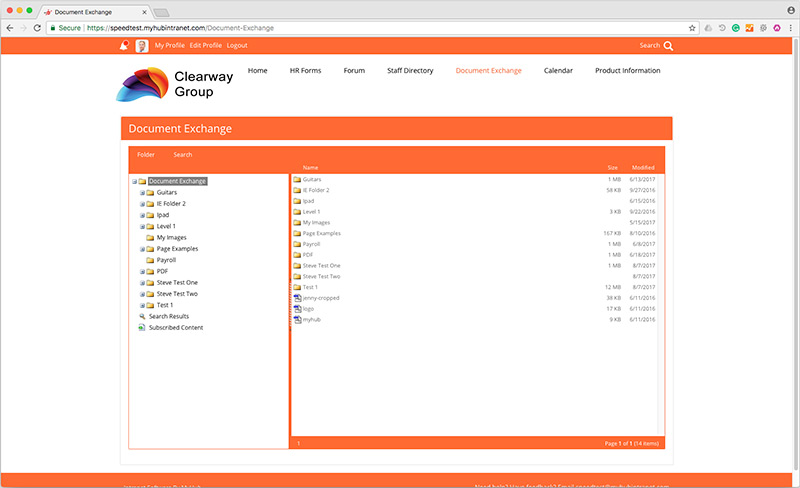 In a page, it is possible to set up hyperlinks to files stored in the Document Exchange. 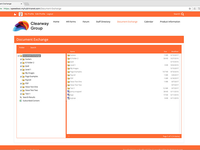 The ability to set up a hyperlink to a folder in the Document Exchange does not currently exist and we hope that this major enhancement would be made available at some point in the future. Overall: It enables us to disseminate and capture information that we need in a very effective and low-cost way. Overall: I was a little apprehensive about using this software as we have very limited experience. However it did everything and more that we were hoping for. In addition the support that we received was second to none. The cost was extremely reasonable and everything more than surpassed our expectation. We had a couple of one to one's over the phone to get some support to get us started. I soon picked it up and the results really have been impressive. We have had nothing but positive feedback about the site we built using the software. If a lawyer can get to grips with it then anyone can! I'd really like to find something negative to say to balance things out but I genuinely have nothing but praise for the software and the individuals we dealt with. Recommendations to other buyers: We thought about getting started with this software for a while. Don't make the same mistake. Give it a free trial. It really is easy to use and the results are extremely good. Pros: It's very easy to use - I've already seen powerful updates - but very graphically based for the non-techy user. The ability to control permission for the users is also amazing. You can even control specific permission for widgets within a page if you needed to. Also, users can manage their own accounts to no more chasing lost passwords. Cons: I haven't found any cons yet. There was a little learning curve, but their support took me through all of my questions with ease. Overall: My experience with MyHub has been tremendous. From the start of my free trial to the incredible support after I signed on, the experience has been top notch. I even got a DM on twitter referencing my recent training session and trainer by name. This service is easy enough for the beginner, but powerful enough to really do some amazing things. I use it as a value add for my clients and a place where they can all easily access the appropriate information in a simple and visual way. I would highly recommend this to anyone looking for a hub for all their company's documents, files or even a place to interact and control user permissions. Recommendations to other buyers: I highly recommend this to anyone. I did a lot of research in advance and this company SEEMED far and away the best. My experience with them has proven that correct. I can't say enough about the support I've received for even the smallest of questions. The Intranet site that is simple, with amazing customer service!! Pros: My HubIntranet is easy to use, for technical or non technical staff, the knowledge base is easy to use with step by step guides and videos. I have used them for several years now and the features keep growing. Cons: It's not super fancy as far as templates, but for the delivery of information it is great! Overall: I wanted a site for internal information, what I found was not only an internal site but I can integrate with Google, create forms, do mail list, have forums, and have the flexibility on users and groups, down to pages. Easy to use Intranet helps us keep everyone informed and up to date. Pros: Easy to use and setup. We were able to create several pages internally and roll out to 200 some people in a matter of days. Tremendous value compared to a number of other options I looked at. Support is very good as well. Cons: Some of the page layouts seem a little difficult to work with. 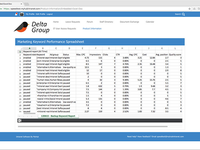 Overall: Overall we are very happy with this software. When I was hired, one of the things my employer wanted was a company Intranet. After looking at numerous options, we settled on MyHub and have been very happy since. This has allowed us to share the newest information company wide, all at a very affordable price. Pros: Intranet can get very limited usage if not managed well. 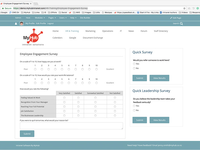 MyHub makes it easy to implement for organization engagement. It has most of the functions like the modern social media so employees like to use it. But at the same time, it functions well as a internal portal for sharing news. Cons: if the software can be integrated with more project management functions or other project management softwares that could be better. It will be easy for workplace work software and workplace social software to be in a same place. Pros: MyHub is easy to set up, you don't need to be an IT person to have a great intranet, the resources to support you through the process is great, not to mention their support staff. Cons: The pages are built through modules, it would be nice to have choices of templates to add content to. But the pages are functional once you take the time to design it! Pros: The software is very intuitive. The Video Help is brief and useful and the their team offers unbelievable support. I am writing this at 12:41am and just had a problem resolved by their team on a Saturday, their time. Did I mention, they helped us with a technical setup that should have been handled at our end! Overall: This software has become a daily pillar in our operation. We count on the MyHub Intranet solution and their support team to keep a real-time pulse on inter-company data/knowledge sharing, as well as with vendor and client partners. 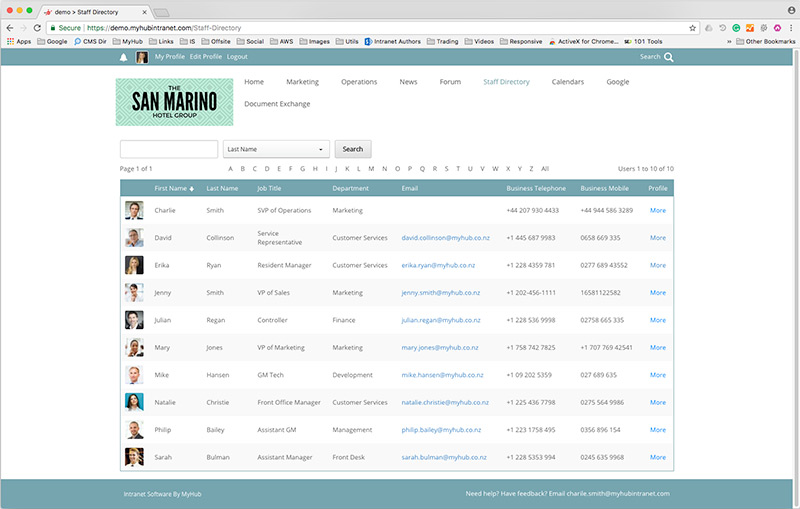 Pros: We love the ability to constantly customize our pages. 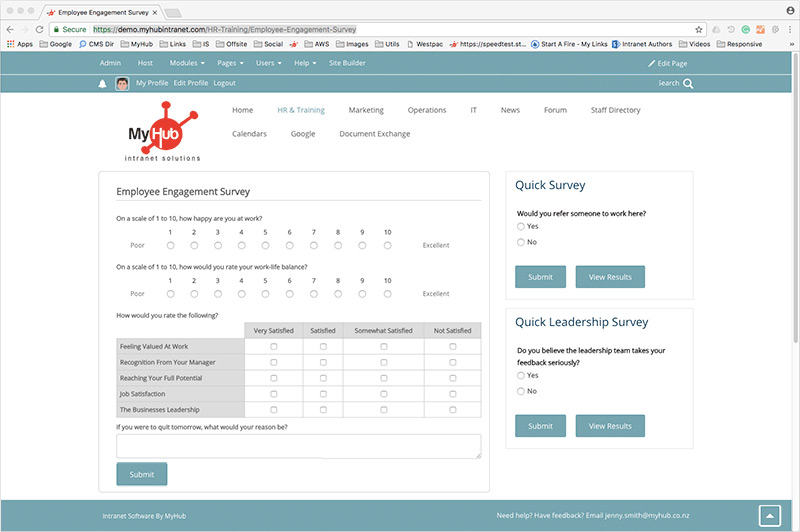 We want our employees to fully engage with our Intranet, and the constant changing of pages keeps them interested. Cons: We had to learn how to create and manage an Intranet on our own. MyHub had an add-on that we could purchase to have them set us up, but we felt we'd still be active participants in that aspect. 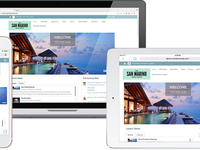 Overall: Our Intranet has taken on a life and personality for our company. We actually named it and use it very creatively to manage processes, people, activities and notifications. MyHub support is super-responsive and friendly, even when we're sort of grumpy customers. Technology is hard. They make it easier. easy, powerful, customizable -- exactly what we need! Pros: modular product! very clean and straight-forward. -- different usage models, very easy to customize and edit. -- lots of different types of modules, forms, images, videos, features, news, etc. Cons: Calendar and new modules are a little less flexible. We are waiting patiently for the org-chart layout. Overall: This has been the easiest product I've ever used! It's powerful and intuitive. And the service we've received has really been stellar -- The CEO responds to questions within the same day, across the world! We've been able to build 88 pages of internet content in about a month with little to no support. Very easy and the result is a beautiful, customized reflection of our company! Recommendations to other buyers: This is a great product if you want to be able to tailor it to your needs. Less is more for us, so we really looked for something that was clean and simple, that didn't have a thousand bells and whistles. Overall: I could not be happier, Reps have been incredibly helpful throughout my (long!) Journey to get from concept to go live. They provided great advice, recommendations and tips on how to get the best out of the solution. Pros: Feature rich with ideas I hadn't even thought of. Cons: Nothing to date, you just need to bear in mind that you are editing content live, although you are able to roll back if you make a mistake. 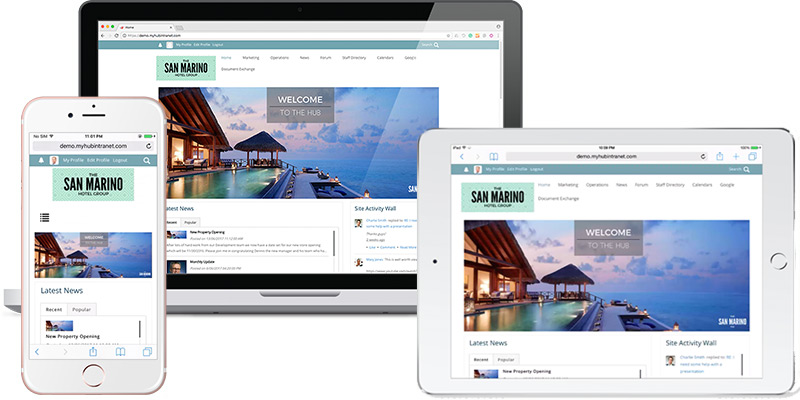 Overall: We wanted to move away from an internal (on premise access only) Intranet managed with Dreamweaver, to a secure Internet based Intranet where our staff members can access the site from any Internet connection with a PC or mobile device. MyHub Intranet makes it very easy to achieve this with us still able to have the site protected by username and password. The site is very easy to administer, and their technical support team is one of the best that I have experienced. Pros: Throughout, the myHub support team have been on-hand to patiently answer any questions I had while building my site. The platform itself is very intuitive and easy to use. It syncs perfectly with Google Suite (single sign-on etc), and whenever I encountered any hurdle, the myHub team always knew a way round it. Above all, this software is brilliant value for money. It is a flat fee, instead of the extortionate "per user, per month" rates that most of their competitors charge. I highly recommend myHub for a scalable knowledge mgmt solution. Cons: No cons so far- my experience has been really positive. Great software and great support. Pros: Very easy to use and setup. Many modules allows you to add pages and easily customize them by security role. Admin features let you see who logs in and other reporting. Cons: Some pages work better in Chrome than IE, but not a huge issue. Overall: I use the software to display information for a business user group. Let's me control pages, modules, users, and content (documents and files). Pros: The ease of use and functionality that it had. I was just what we were looking for to add another layer of communications and collaboration with the Staff and Management of the Hospital. Cons: Needed to include the ability to edit the login page and footer of the our intranet site. Overall: Trying to incorporate an intranet to share and communicate internal only documents, news, calendar of events to name a few. My hub had exactly the right mix of functionality we needed and was looking for. Pros: The customer service I received was great and they were helpful throughout the setting up process and helping me to learn more about what is doable on the site. The price is reasonable for what you can customize. Cons: There are some limitations to what you can customize. It is a bit clunky and slow moving. Overall: We are using MyHub for a customer forum - it has the features and flexibility that we were looking for at a cost that is not outrageously expensive. Pros: The functionality and ease of use. A site can be developed quickly and maintained easily. Cons: A very nice enhancement would be to be able to upload data at the folder level rather than just at the file level. Another nice enhancement would be the ability to see the font size and other details for the text that is on a page. Overall: The customer support is truly outstanding and a gold standard in the industry! Pros: Support is amazing and friendly. Product is simple to setup and great to use. Great value for money as an out of the box solution. Cons: Perhaps slightly slow, however faster than others. Easy of use - simple! Cons: You cannot bulk upload a file structure to document store, this would be really helpful and time saving. Overall: Our marketing team needed a place to upload updates and files and share them with our distributors and fellow salesfolk. MyHub was a perfect solution. It even eliminated our need to build a dealer portal! Recommendations to other buyers: Play around in it before you start putting a lot of effort into building the pages. Test page permissions, groups, and editing the modules. There's a shallow but existent learning curve. Don't lose your work by mistake!